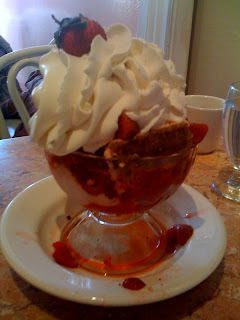 We knew this place was a tourist trap, but we're all about trying something new so we went to East 60th Street on a bitterly cold day to the famous dessert parlor Serendipity 3. We were surprised at how tiny Serendipity 3 was from the outside (black awning in the brown building). 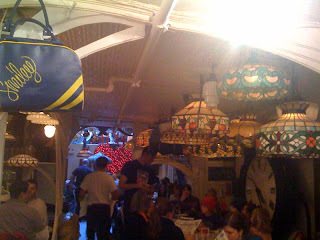 The first miserable thing about Serendipity 3 was how crowded it was. We were actually surprised that the wait was only 30 minutes. However, the 30 minutes seemed like a lifetime because there is no waiting area. We were stuck in a tiny space at their general store area in the front where you're forced to stare at tacky and random oddities they sell, while getting pushed and shoved by adults wearing fur coats trying to get in and out through the door. The downstairs area is decorated with Tiffany-style lamps. 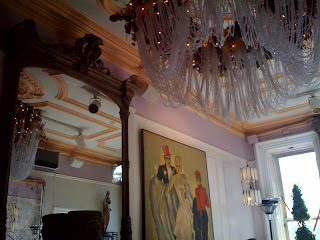 We were seated upstairs where the walls are pink and adorned with mirrors of various sizes. 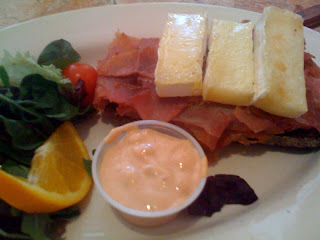 We understand that Serendipity 3 is famous for its desserts so we didn't have high expectations for their food, but we were surprised at how bad their sandwiches were. And this statement speaks volumes when you take into consideration that we had not eaten all day and were starving by the time we received our food. 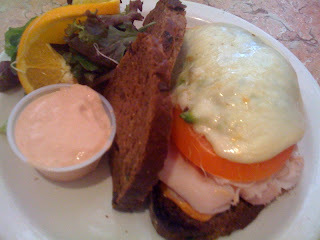 Their Haight-Ashbury sandwich was ho-hum and forgettable. I ordered their High Heel Pump. I like proscuitto. I ADORE brie. I love bread. And I live for dressing. So how could a meal that is comprised of all things that I love combine to create such a horrible mess of a sandwich? The proscuitto was incredibly salty. The bread was stale. Their Russian dressing was simply bad. The brie was overcooked, not melted. More importantly, the sandwiches cost about $14, which makes the crap you're served taste crappier. But we were determined to turn our experience around - we really wanted to believe the desserts were deserving of its notoriety. 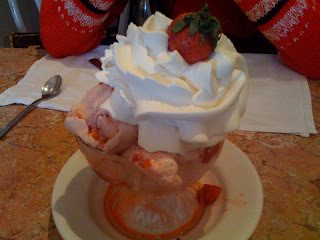 So we ordered their Strawberry Fields Sundae (cheesecake, strawberry ice cream, strawberry topping with whipped cream). It looked pretty enough. And it was huge. This dessert is suitable for four large adults or six kids to tackle. After trying one of their famous desserts, we can now say DON'T BELIEVE THE HYPE. The dessert was nothing special. It was just your basic strawberry ice cream, your basic whipped cream, your basic strawberries, your basic strawberry sauce, and a horrible cheesecake served in a very large bowl. That's it. We could have made it at home. Definitely not worth $15. So there you have it. Overrated, overpriced marginal food and desserts served in a cramped space. Oh and even their basic black coffee sucked. So after coming home monumentally disappointed, we wanted to do some further research to see if we were just the lone crazies that just ordered the wrong things or if there were other New Yorkers that shared our views. 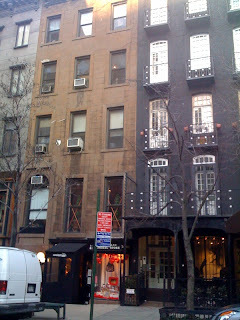 And what we found were that while many travel shows and publications like Frommer's had nothing but the sweetest things to say about them, the average person living in this city were equally pissed off about wasting their money at Serendipity. Even their signature dessert the Frrrozen Hot Chocolate was described by reviewers as nothing better than your store bought Nestle Quick. We concluded that Serendipity 3 has mastered the art of publicity stunts that get them more media coverage that they deserve. That's why there's a $1,000 Golden Opulence Sundae on their menu and that's why in 2007 they unveiled a $25,000 dessert called the "Frrrozen Haute Chocolate," which Guinness World Records declared the world's most expensive dessert. Seriously, who cares that there's gold and diamonds on it (would rather wear it than eat it). We're not sure if anyone bought one, but there were a lot of pissed off New Yorkers who were disgusted by this ostentatious PR gimmick and the fact that this would be added to the list of why people outside of New York think New Yorkers are nuts and why so many poor countries have this view of us as gluttonous pigs. But of all the many bad things we read about Serendipity, nothing was quite as bad as this article. We certainly would not have gone if we read this before heading out. Serendipity is supposed to be the fortunate thing you discover while looking for something else. We really wished while looking for Serendipity 3 yesterday, we could have found something else.